Induction heating technology is increasingly being used for industrial forging applications because it offers an unbeatable combination of speed, consistency, control and efficiency. GH FG Type induction heating machines are designed for large part forging applications. The modular design enables us to build a customized system from standard elements to meet your specific requirements. The main components of each machine are the feeding mechanism; the power supply and frame; and the output section. Our FG machines incorporate a transisterized power supply which operates over a wide range of frequencies with high energy efficiency. The compact single-unit design of the entire system eliminates the power losses normally associated with medium frequency cables. 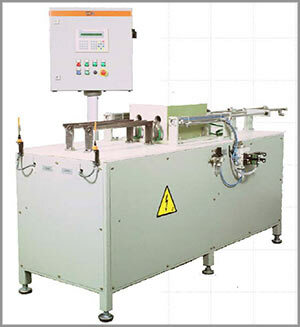 These machines are perfect for high-speed automatic processes, and also provide full manual control for automatic override and process development. Our FH Series Horizontal Forging Machines have been specially developed for heating ferrous and non-ferrous bar ends (screws, ties, bolts, ankles, etc.) in a horizontal plane. 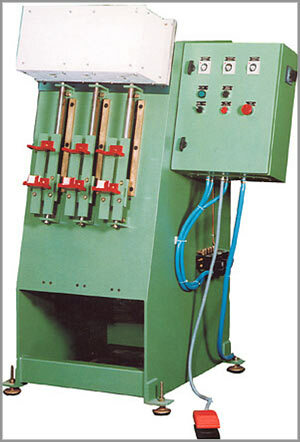 These machines are designed with two or three part insertion openings for manual part loading and automatic extraction. FH Type Machines can process up to 300 parts per hour, depending on the diameter of the bar, load and unload times, and the working power level. Systems are usually fitted with SH or SM induction heating power supplies operating at power levels from 50 to 200 kW. 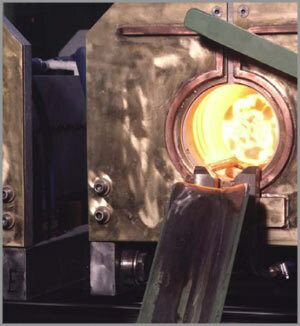 The FM Series Induction Forging Machines are designed for efficient heating of circular or square section billets. The configuration shown at right includes a pusher type billet feeder and an 800 kW power supply operating at 1000 to 2500 Hz. This machine heats 2000 kg/h of round and square steel billets with diameters 45 to 90 mm to a forge temperature of 1,200ºC. Our FV Type Vertical Forging Machines have been specially developed for heating ferrous and non-ferrous bar ends (screws, ties, bolts, ankles, etc.) in a vertical plane. These machines are designed for semi-automatic operation; the operation manually positions the bar to be heated and then removes it from the system after the heating process has been completed. The maximum production to be reached with this type of equipment is about 600/700 parts/hour, depending on the diameters of bars and the power of the induction heating power supply. In the installation shown at right, the heating is accomplished in two phases with dual SM type 400 kW power supplies. With a first power supply, pre-heating is performed at a frequency of 1500 Hz up to 760º C; the second is used to heat the ends to 1280º C at a frequency of 3000 Hz. This machine is designed for pipes with diameters from 48 to 115 mm and incorporates an infra-red radiation pyrometer to ensure that the pipe has reached the proper heating temperature. Count on GH Induction Atmospheres to developn and induction forging machine that meets and exceeds your process requirements.